weather been good all week same few 30m Spanish trawlers around us. 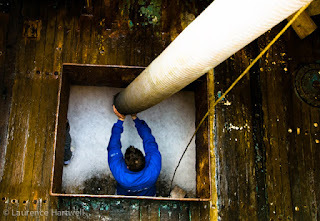 We hauled have our gear yday for 650kg Hake and 250kg w/fish. Just left newlyn weather fine hope for hake again this week. Seven tonnes of ice going aboard the boat this morning. From Newlyn to Chelsea - with love! Top Chelsea fishmonger, Rex Goldsmith cradles one the Ajax's bigger hake landed at Newlyn yesterday morning. As Rex says, "one of yours I believe. Banging fresh. Still stiff. Pleasure to have in my shop!" Hake on the menu in Dorset. Photo courtesy of Russell Brown, Sienna Restaurant. The Sienna Restaurant in Dorset is a happy hake fan! According to head chef Russell Brown the dish is proving extremely popular with customers to the Dorchester restaurant. 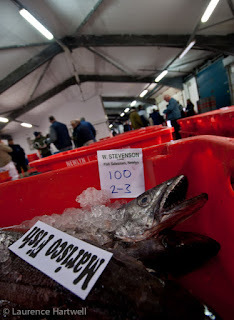 No doubt some of the Ajax's fish landed to day will find themselves on a plate of theirs later in the week. Hake on this morning's market at Newlyn. Photo courtesy of Barry Young:Brixham Fish Market. along with a second consignment sent to the fish market at Brixham.